1. There are three kinds of cacti ~ Thanksgiving, Christmas, and Easter. The Thanksgiving cactus blooms from Thanksgiving to Christmas. Its blossoms are red, salmon-orange, lavender, or white. The foliage segments have two to four saw-toothed points. 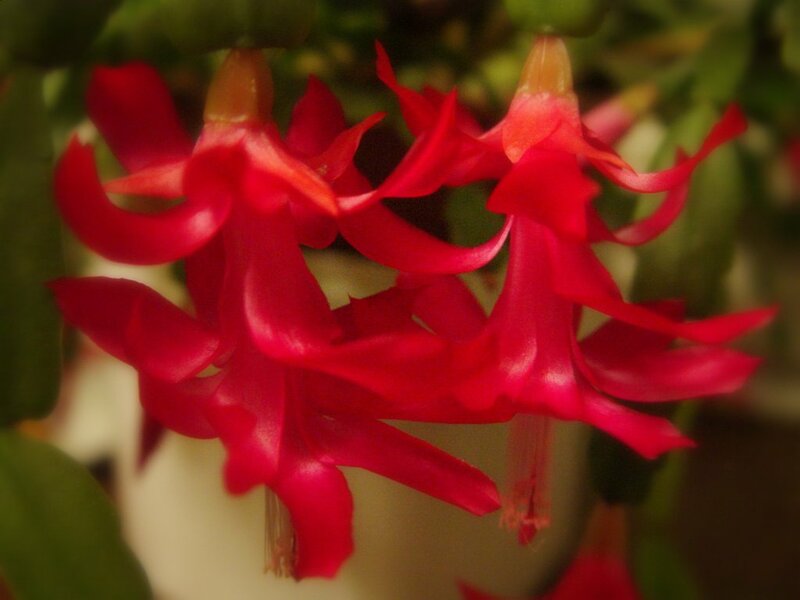 The Christmas cactus blooms from Christmas through March. It has red or white flowers. There are four rounded scallops on the edges of each foliage segment. The Easter cactus blooms sometime between March and May. Occasionally it will bloom again in the autumn. Its segments are smoother, with wavy edges and brown bristles at the very tip. The blossoms of the Easter cactus are generally pink or red. 2. The bloom of these cacti is triggered by short days and cool temperatures. They should be grown in a room that gets natural, bright light and gets dark when the sun goes down each night. They thrive best in rooms that are 65 degrees F. or less. 3. They shouldn't be over-watered. Soil kept on the dry side is desirable, especially in the period leading up to their blooming period. 4. Additionally, Alma's friend, Janet grows beautiful Christmas cactus. Her secret is to grow them outside all summer, bringing them into the house in October. At that time she adds 1 - 2 Tbsp. of castor oil to the soil. She believes this helps them to bloom. She waters them minimally year around. My diagnosis of my Christmas cactus is that it needs to be moved from the living room where wood heat keeps it too warm! And that I need to give it a little bit less care when it comes to watering. My Thanksgiving cactus, on the other hand, spent the summer and fall on the back porch. It was looking so neglected when I brought it into the house that I nearly threw it away. I didn't, and it rewarded me with a plethora of beautiful blossoms at Thanksgiving. Do you grow zygocactus? What are your tips for abundant blooms? Aha! I have an Easter cactus, which bloomed in November and is dormant now. I guess that I can give it a break. I've had the worst time trying to figure out the difference between the three, but this was the best article of information that I've seen on the subject. Thank you very much for posting it! Perhaps I should pick up a Christmas cactus while they're available. Can you believe that I had never seen a Christmas cactus until your post? I hope that you are enjoying these days leading up to Christmas! I have a Thanksgiving Cactus that has moved with me for over 15 years. Many years it wouldn't even bud. Where it thrives now is in one of those (I'm sure it has a specific name) kitchen garden windows bumped out behind the sink. I close the blinds in the evening so it is in a dark, cool environment. It is a joy to open the blinds in the morning and be greeted with the brilliant blooms. With all the extra holiday cooking, I don't mind spending more time at the kitchen sink. Beautiful! My Christmas cactus decided it would be a Thanksgiving cactus this year. I would love to get two or three other colors. I recently saw a gorgeous white one that I think would be spectacular in my home. So I need to get three kinds of cactus to get blooms at the three Christian holiday seasons? Wonder if other religions have cactus that bloom for their holidays. Perhaps there are cactus timed to bloom to cover all those holidays and I could have blooming neglected cactus year around. Of course I would also feel obligated to witness to them about the ONE True God and His Son. I suppose if I could convert them I'd be back to just three blooming options again? Love Christmas cactus. Ours almost died this past year, but is recovering and starting to bloom. These plants thrive with minimum attention. Place outside in shade in summer and water when dry. Leave outside in cool weather to initiate buds. Do not move the plant once buds have formed or they could drop. Protect from freezing temps and hot summer sun.